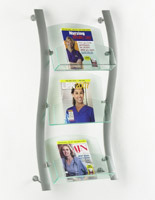 The Magazine Rack has (3) acrylic pockets to fit many publications! 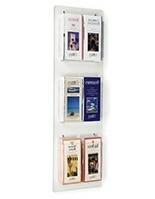 (3) acrylic pockets display many publications. Brushed aluminum finish blends well with any décor. Wall mounted magazine rack gives you more floor space. 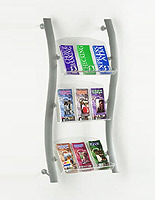 A literature fixture is an ideal magazine rack for tourist attractions, welcome centers, and waiting rooms. The magazine rack has (3) acrylic pockets. These pockets are adjustable, allowing you to place them at any height and angle that you need. 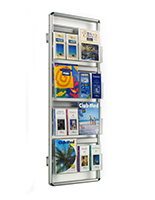 The catalog holder, magazine rack can fit many different publications, giving your visitors a wide variety of information. 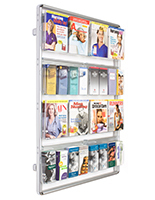 Featuring wide pockets, this magazine rack can fit many copies of a publication, making sure the display will look full. 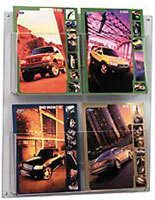 Wall mounted displays, catalog fixtures, and other magazine rack styles are made from brushed aluminum. With a silver finish, brushed aluminum is strong and will match virtually any environment. 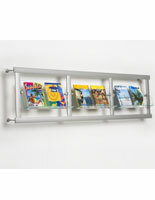 This catalog holder, magazine rack is designed for indoor use only, and when used properly is rust-resistant. The magazine rack is wall mounting, giving you more floor space while still providing passersby with information. 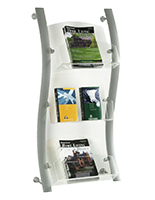 This magazine rack, also known as a literature display, uses (3) pockets to ensure your visitors can obtain any information they need!